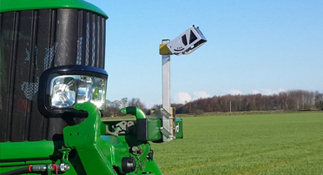 Robocrop is the original and best crop imaging system which achieves excellent row following by viewing multiple crop rows over a large area. 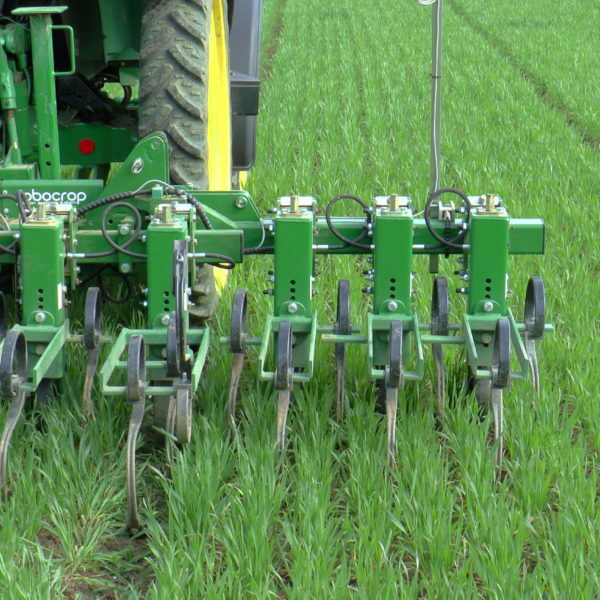 Utilising the Robocrop grid matching technique accurate row following is possible even on narrow row cereals and multi-line (carrot type) rows. 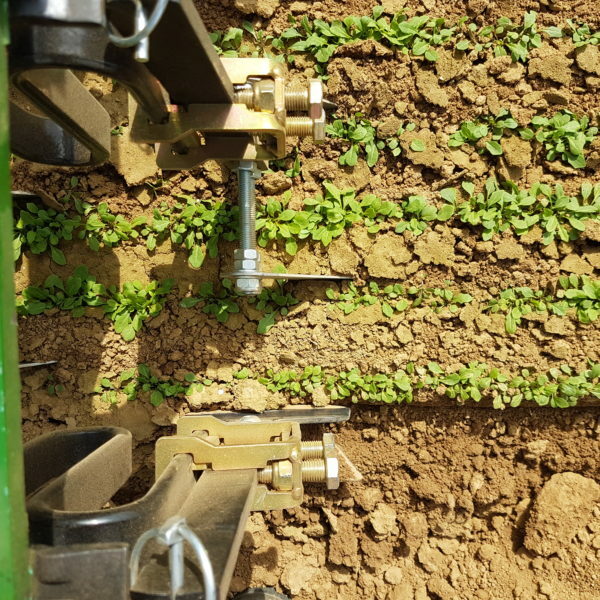 Images are analysed at a rate of 30 frames per second and the direction of the hoe adjusted via a hydraulic side shift with anti-backlash action. Accuracy is generally 15mm at the camera or with the addition of soil engaging discs better than 10mm accuracy is possible. Forward speeds of up to 12kph are common and higher speeds have been successfully employed. Garford hoes have been specially adapted to cope with these extreme speeds. Special pressure rams keep the soil engaging components in work and improve penetration in hard conditions. Garford Slash blades ensure no “slip by” of weeds adjacent to the row and also provide good foliage clearance to prevent stripping. 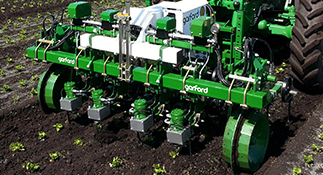 Garford inter-row cultivators are custom built to suit customer’s requirements. 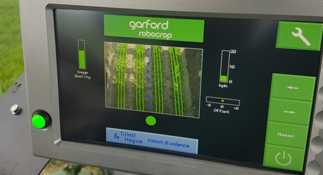 Garford have experience in models for all row crops. A wide range of shares are available including the traditional duck foot A share, flat A shares, L blades, and Garford’s specially developed Slash blade which ensures no “slip by” but also has good plant foliage clearance. 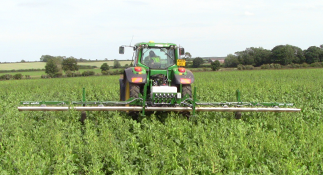 See the brochure for the full range of tools including crop protection shields and discs. 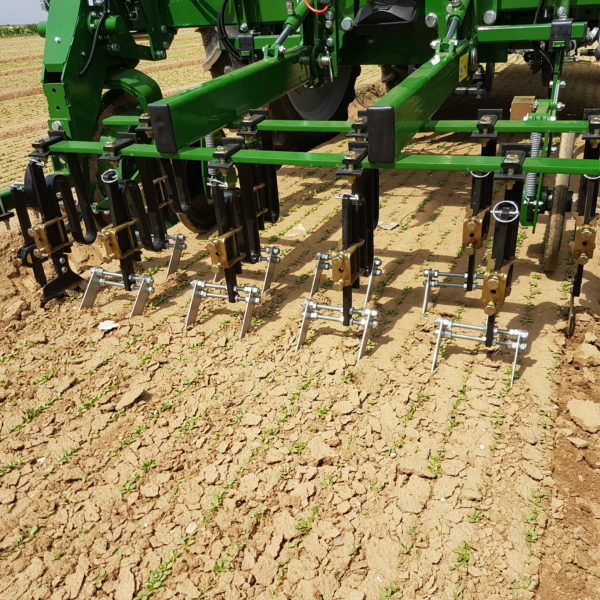 Models from 1 row up to 18mtr hydraulic folding frames with 24 mtr as a trailed machine are available.Special raised bed system cultivators feature ridging ploughs in the wheel tracks and a range of special shares between the rows on the bed. Most models feature the Garford pressure ram which adds weight to each unit and prevents bounce when working at high speed. 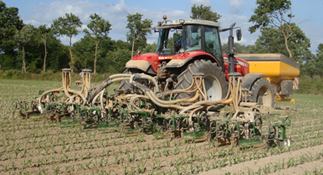 Speeds achieved are between 8 – 15kph, but this will be varied depending on crop type and row spacing. 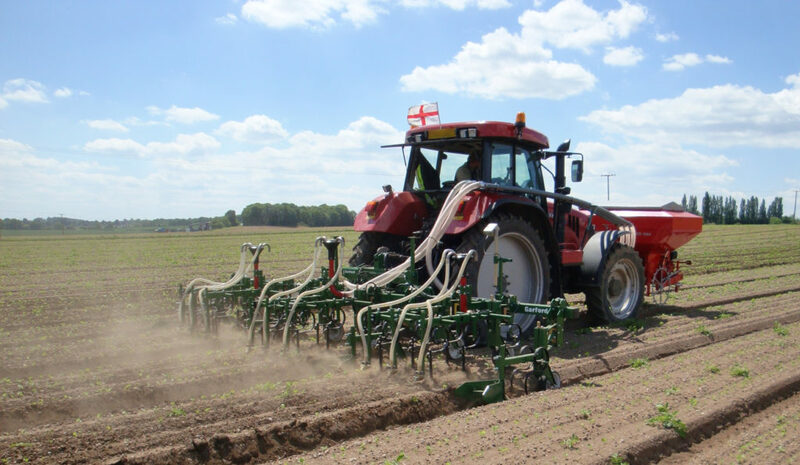 Hoes can be front or rear mounted and can be guided by the tractor driver, by a second operator on a seat behind the hoe or for the very best performance why not go for the Robocrop precision high speed guidance system. 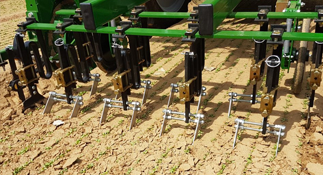 New features to the Garford Inter-row being the tine raiser feature for those fields with tight headlands, obstacles in the field or varied shaped fields to prevent overlapping and allowing for effective headland management. 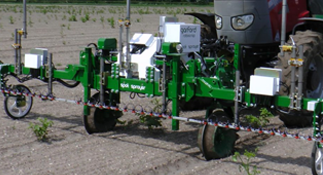 Robocrop Guided Hoes are available to those growers with delicate cropping such as spinach or small salads. 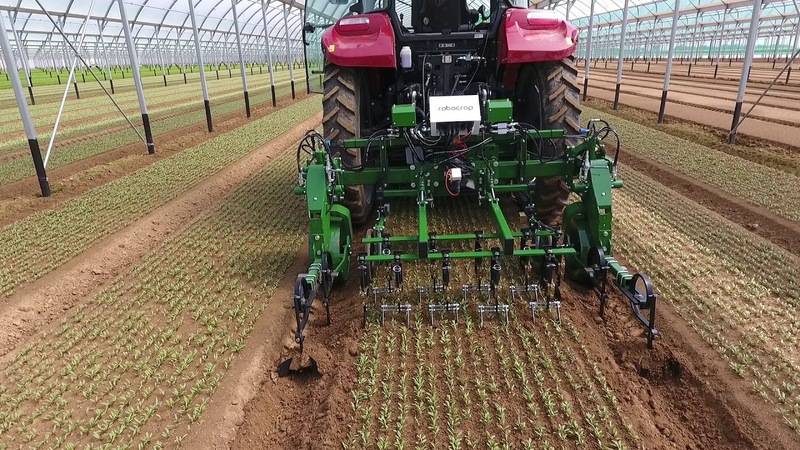 Garford offer a Robocrop Baby Leaf Salad Hoe being able to work in accuracy of 6 cm row spacing still achieving the high accuracy from share to plant, using special shares that allow for a gentle movement of the soil for mechanical weed control. 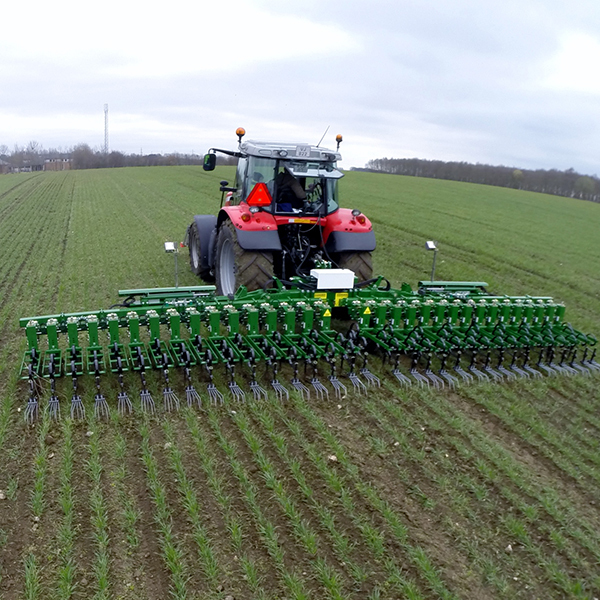 The Robocrop high speed guided hoe lends itself to the precision application of fertiliser, with the addition of a front mounted tank and metering system with distribution heads and shoes on the hoe. 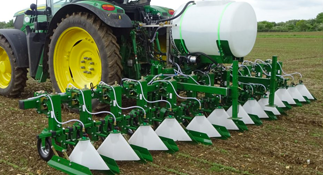 This allows the grower to place the precise amount of fertiliser accurately at the area the plant requires for growth, reducing overall fertiliser usage, avoiding surface run off in wet weather and protecting local water courses from pollution. At the heart of our Guided Hoes is the Robocrop Side Shift – download the Robocrop Side Shift brochure.